One of the world’s most famous landmarks will soon be no more. 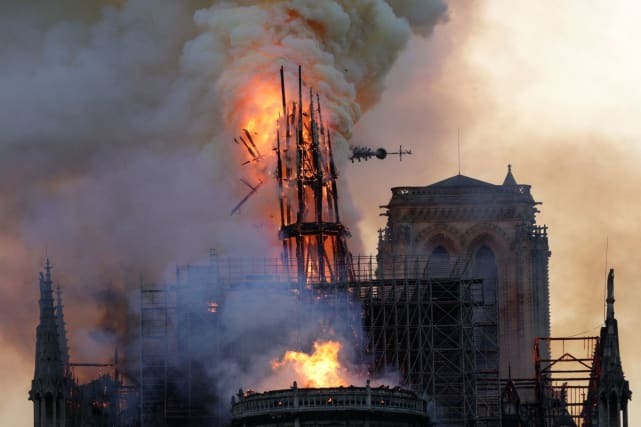 This is the horrible reality we now face, as Notre Dame Cathedral in Paris caught fire on Monday, April 15, igniting into flames that appear to be threatening to topple the entire antique building. Such a targedy has caught the attention of anyone who has visited this religious building in France, along with anyone remotely familiar with its history. This includes many celebrities, of course. 1. What’s the History Here? Construction on Notre Dame cathedral started in 1160 under Bishop Maurice de Sully and was largely completed by 1260, although it was modified often in the following centuries. The cathedral ahs been the subject of or has inspired numerous works, such as Hugo’s The Hunchback of Notre Dame and its 1996 Disney film adaption. Approximately 12 million people visit Notre Dame annually, making it the most visited monument in Paris. 4. This is Awful. What Happened? It’s not entirely clear, but construction next door appears to have played a role in the accidental fire. As you can see, Twitter has been keeping folks up to date with tragic updates. No injuries or deaths were reported as a result of the fire, which broke out minutes after the church closed to the public for the day. Approximately 400 firefighters were deployed to the structure. 6. How Has Donald Trump Reacted? In typically idiotic fashion, as you can see above.